European premiere of this multi award-winning play from Pulitzer Prize nominee Rajiv Joseph. Directed by Jamie Lloyd, Designed by Soutra Gilmour. 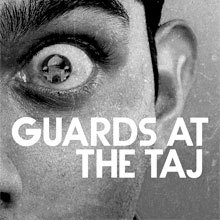 ‘Guards at the Taj’ was the inaugural show at the newly refurbished Bush Theatre, running from 7 April – 20 May 2017 and attracting sell-out audiences and wide critical acclaim.